I’m wearing stretchy pants as I write this and for good reason. I’ve just spent the weekend road tasting my way around healthy cafes in Auckland. The waterfront city on New Zealand’s north island surprised me with their dynamic foodie scene. You’ll find farm-to-fork fare aplenty, Paleo and raw cafes popping up and more than enough whole foods destinations where you can source healthy takeaways Auckland style. As with our other healthy eating guides for destinations including Bali, Ubud, Queenstown, New York, Kuala Lumpur, Hong Kong, Sydney and Melbourne, this is just an appetiser. We happened upon Eighthirty when we got lost on a morning walk. I couldn’t resist the sound of the coffee machine and the funky, urban interior. The coffee was smooth and clean and the perfect heart starter for the morning. Eighthirty has several cafes around the city. Kokado is Auckland’s first organic coffee roaster. They have been roasting coffee for 12 years and supplied many of the cafes we frequented around the city. The Kokado cafe is located about 10 minutes from the centre of Auckland, in Grey Lynn. You can grab everything from a regular espresso coffee to speciality pours and cold brews. They also have coconut and rice milk. The food menu features organic, vegan and gluten-free whole foods options. Love coffee? Read more about the latest healthy coffee trends here. We found Foxtrot Parlour after a long walk that led us to the Ponsonby Central Market (a foodie paradise) on a Saturday morning. The place was overflowing with people, which is always a good sign. 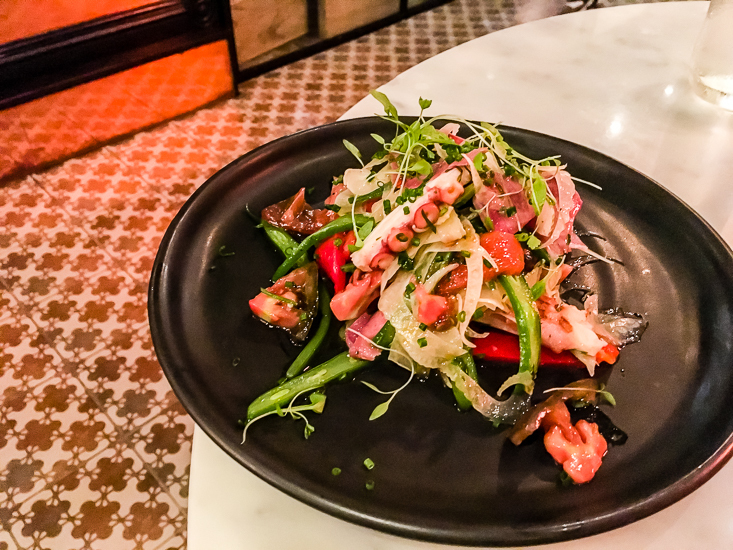 The menu is a good mix of healthy and naughtier options, all with a comfort food feel. I had the Henhouse Raid (creamy scrambled eggs with homemade chutney, bacon and toast – I ordered the gluten-free bread which was good). The Hubby ordered the Mince on Toast and added a poached egg. He practically licked the plate clean. Kokado cold brew, Quinoa Almond and Honey Granola, Creamy Mushrooms on Toast, Salmon Mash – the delicious menu makes it hard to decide what to pick at Corelli’s Cafe. This cosy corner cafe in Devonport offered us a delicious escape on a drizzly Sunday morning. It was busy with the weekend crowd, hugging steaming cups of tea and coffee in the space that resembled a country home; decorated with locally crafted ceramics, fresh flowers, bowls of vegetables and an eclectic mix of furniture. I couldn’t go past the Byron Breakfast (New Zealand salmon with avocado, spinach, roast tomato and wasabi mayo with gluten free toast) and a long black brewed from their coffee that’s roasted onsite. Just down the block from Corelli’s is Zest Organic Store and Cafe. Raw foodies and vegetarians will love Zest. The cabinet is full of fresh, healthy, homemade options and raw treats. Order a superfood smoothie to take on the run or grab a few organic grocery essentials. Paleos listen up! Wilder and Hunt should be at the top of your Auckland hit list. The shelves are lined with house-made goodies like Protein Nutola, seed crackers, Paleo aioli and nut butter. For the time poor, they have ready-made meals in the freezer (at a very reasonable $NZ100 for 10 or $NZ19.95 each). We shared an egg wrap with chicken and salad and a beetroot and micro herbs on the side. It was light and tasty. Also in the cabinet were bunless burgers, Paleo tacos along with vegan and vegetarian options too. Can’t make it to the Ponsonby cafe? Check their food truck calendar to see if they can bring some grain free goodies to you. 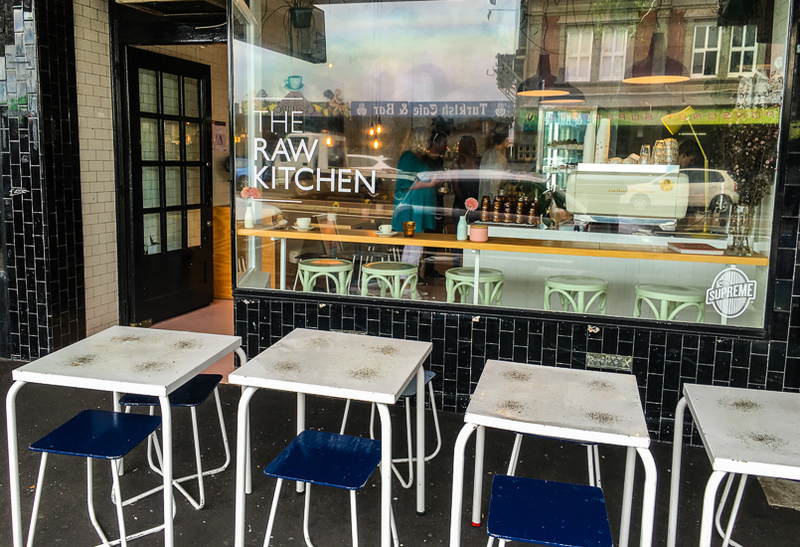 Walking into The Raw Kitchen is like stepping straight into a Pinterest ‘interiors inspiration’ board. White subway tiles, industrial style lighting and pops of pastel make it a lovely, light and welcoming space. On perusing the fridge, it appeared to reflect their food philosophy – simple, clean, raw food from ready-made salads and chia puddings to raw snacks, flavoured waters and kombucha. Stop in for an afternoon snack and try the turmeric latte with one of owner, Olivia Scott’s famed raw cakes. When it comes to healthy cafes in Auckland, The Unbakery by Little Bird Organics is a must-try. That was until we spotted the cute bird feeder clinging to the wall outside that marked the entrance. The Unbakery serves raw, organic food in a beautiful setting. Exposed brick walls, high ceilings, and artful light fittings make the Ponsonby space somewhere you want to spend a little time brewing ideas over a freshly brewed cuppa. There is no shortage of tea options either. The lower fructose smoothie blends caught my eye too, but just try to resist one of the amazing raw cakes on display! The Ceres Fresh Market was buzzing when I took my ritualistic stroll around the store reading every label. 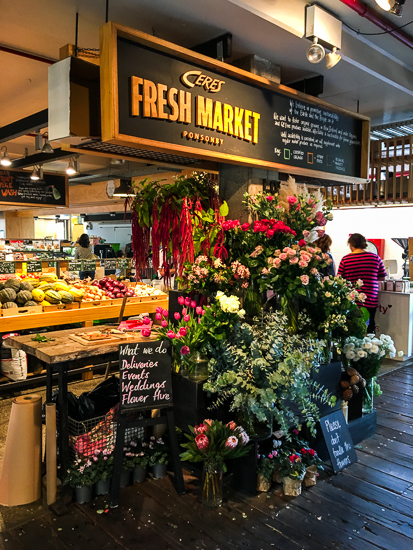 Ceres stocks local, organic and GM-free products with the aim of making real food “available, affordable and sustainable for future generations”. It’s a one-stop organic shop right in the heart of the Ponsonby Central selling fruit and vegetables, flowers, pantry supplies and anything else you might need to whip up a healthy meal in your AirBnb. You can grab a fresh juice or smoothie to take away from the smoothie station too. A cute cart overflowing with gorgeous organic herbs and vegetables was the first thing that caught my eye at Huckleberry Belmont. We were driving past and we had to pull in for a browse. The store is clean, cute and particularly well stocked for its size with everything from allergy friendly pantry essentials to skin care products and Kokado organic coffee to take away. El Sizzling Chorizo is the spot for meat lovers. 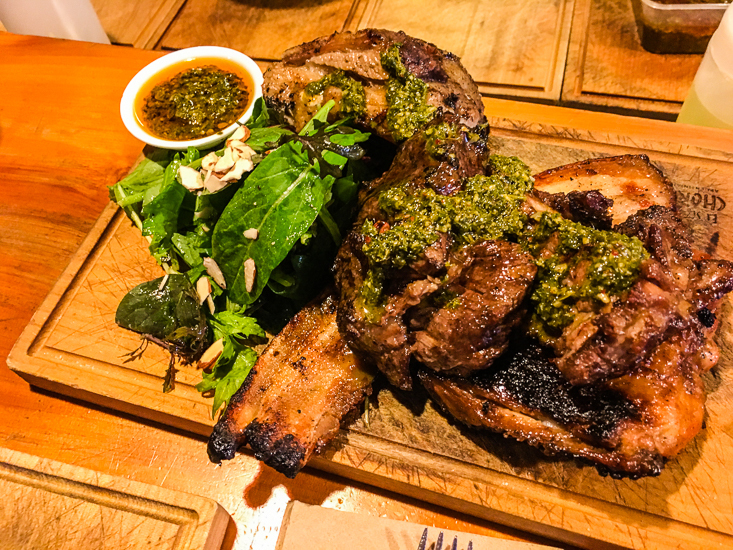 The Argentinian barbecue restaurant serves up sizzling meat straight from the coals with vegetables, salad and chimichurri on the side. Order the organic steak and a glass of Malbec and sit at the bar to watch the action on the grill. Date night? Go to Baduzzi. The Italian restaurant has built their menu under the banner “Food for the People” and also takes a nose-to-tail approach. 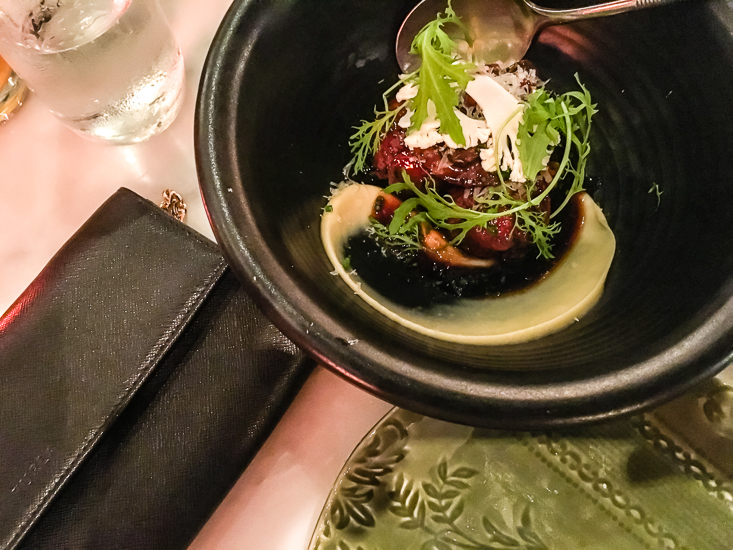 Meatballs (polpette) are their signature, so we shared the Wild red deer meatballs, portobello mushroom with parsnip crema, we also tried the Sardinian style octopus w poached pork tongue & heirloom salsa rossa and the Buttered maltagliati with duck & porcini ragu, buttercup & pickled black walnuts. The meatballs were the standout for me and the best I’ve ever had. At The Grill by Sean Connolly, the celebrity chef delivers simple, honest, slow food in a fine dining setting. Connolly has crafted a menu using ingredients and produce from local farmers and artisans; Picture perfectly cooked pasture-fed meat, sustainable seafood and seasonal sides, all paired with delicious New Zealand wines. The restaurant setting is warm, intimate and romantic. We had to start the meal with half a dozen bluff oysters and the steak was the obvious choice for the main course; The Hubby tried the Savannah Angus (North islands west coast) pasture fed rib eye aged in the bone and I ordered the Pasture fed wagyu rump from Hawke’s Bay. The rump was one of the best cuts I have ever eaten and my favourite side had to be the Pickled local beets with white anchovy and shallot which I will definitely attempt to recreate at home. Skye is the founder and editor-in-chief of The Fit Traveller. She is a journalist, writer, photographer, intrepid traveller and a former personal trainer with a passion for helping others reach optimal health. As a TV journalist and producer, Skye has worked for household names such as 60 Minutes, Sunrise, TODAY and Nine News. She has also written for Women’s Health, Fodor’s Travel and Yahoo7 Travel, among many others. Skye created The Fit Traveller as a beautiful online space and community where people feel inspired to escape the desk to move and explore more. Equally comfortable in a 5-star resort or hiking a far-off mountain, Skye loves the unexpected and enriching life experiences that each trip brings and can often be found in a backstreet chatting to locals with her camera in hand. Skye is based in Sydney, working to master the balance between motherhood and her insatiable appetite for adventure.